Pilgrimage to Heresy - "The Camino"
Evidence for Saint James...or Lack of Evidence? for a synopsis of her ongoing research. for like-minded discussions on what is probably the best Camino Forum in English on the web. The Camino de Santiago, or de Priscilliano? So much has been written about the Way of St. James that it would be futile to add too much here. I walked my own Camino in 1999. I began on my own. Where the idea came from, or when it started I simply still cannot say. I only know that when I arrived at the refugio in Pamplona, I was out of breath even walking from the bus station, I had never walked more than five miles in my life, and never with a backpack of any description. I was in my late 40's. I was also scared to death. For months I had bored anyone who cared to listen politely that I intended to "do" The Camino. I wasn't boasting, I just knew that if I told enough people I wouldn't be able to back out! It is only nine years ago, not even that yet, but the pilgrimage was only known to a few people. It had not yet become the almost household word it is today. As I have said, I began alone. Despite good intentions, I likely would have remained alone had I not met some wonderful people very early on. By the time we reached Cacabelos in Leon we were nine people speaking amongst us thirteen languages. The "last supper" in the book is very much based on a real event. I got as far as the Puerta de Perdon in Villafranca de Bierzo and then made one of those decisions one makes which ever after make one wonder "what if". A commitment to a work situation and a boss who wouldn't have known a pilgrimage from a pomegranate resulted in my cutting short my walk. I had 175 or so kms to go. Within three days I quit my job in disgust, but it was by then, for me, too late. I spent the winter absolutely longing to go back. Three of my fellow pilgrims came to spend Christmas with me and my daughter who had joined us in Leon, and later that summer would go back to Roncesvalles and complete her own pilgrimage. So it was to a very different and much wetter Camino that I returned to in Villafranca the following Easter. I made new friends, and I arrived In Compostela on Good Friday. After having crossed in front of the facade and turning much as Miranda does in Pilgrimage to Heresy, I wrote an e-mail to a friend. "Am I in a State of Grace?" I asked. "Because I can't seem to get this silly grin off my face!" Later that year, I went back to the Pyrenees, this time starting at Somport and continuing along the Camino Aragones (as Kieran and Miranda do), joining the mainstream, which is how it strikes everyone at Puente la Reina, and continuing on to Burgos, where this time, I caught the train, and felt distinct envy everytime I glimpsed a backpack. The following year, my daughter and I walked from Le Puy to Conques on the Chemin de Sant Jacques. My best memory of that walk was getting caught in a thunderstorm on the way to Le Domaine Sauvage, a 12th century supposedly Templar refuge, and going to sleep on a balcony looking down at the embers and shadows from the largest fireplace I have ever seen while everyone else was trying to dry off. I have been told by friends who have walked the Camino Frances in recent years that there are so many people walking, so much commercialism, that the magic is gone. I would say that the "magic" is what you make of it, whichever route you choose, and many of the other routes are now becoming more accessible and popular as the Camino continues to take hold of peoples' hearts and minds. I would like some day to walk the Camino Primitivo, not least of all because I think that perhaps it was known to Priscillian and his followers especially. There are so many links now, so many associations, so many publications. I will gradually be adding links here as time goes on for the ones which I think capture the essence of the Camino. For now, I am adding only one by "Overlander" which I saw last year, and which reminded me so much of the "feeling" of being a pilgrim with no particular religious afiliations. "Is what I'm looking for what I'm gonna find?" Mark's words, ("It doesn't matter; it doesn't matter") even today remind me of those days when I was "sick of the ole Camino!" Brilliant work. Want to hear Tracy Saunders's recent interview with Hannah Murray of REM radion, Marbella? "This is by far the best book that I have read all year. Part fact, part fiction, the book is borne from the author's own experience of walking the Camino, the pilgrimage route to Santiago de Compostella in northern Spain, loosely based on her own experiences, interwoven with 2 love stories, that of the 2 main characters, and that of Priscillian, the first Christian martyr, and his maybe (?) fictional love. This is much more than a work of fiction, and comparisons to Dan Brown are unfortunate, since the book is nothing like his work, but so much more in depth. This is a tale of love and beauty, a tale of triumph over adversity, but most of all, a tale of intrigue, which I heartily recommend." "A different look at the Camino and the idea of pilgrimage in the 21st century. The story of Priscillian of Avila, though well known in Spain, is virtually unknown to most modern pilgrims outside of it. Pilgrimage to Heresy introduces us to Priscillian with the teasing suggestion of a mystery. Well worth a look." TopicsCraze. "While I was walking the Camino, I had so many questions. By the time I reached Santiago de Compostela, I realised I had answered most of the personal ones. But one questioned remained: what about the "myths" of Santiago? How much was true? Why did I make this walk? This book did not provide me with answers: in fact, it opened up more questions, and some I wasn't entirely comfortable with, even now. But it gave me the opportunity to view my camino as just that: "My Camino". In it I realised that I only had to believe in what I had experienced. It didn't matter what my guidebook told me. It only mattered what I had arrived with." Pilgrimage to Heresy offers a fascinating insight into the turbulent times that transformed Christianity from personal belief into organized religion. Beautifully written, the story weaves between the ancient past and the modern day pilgrims on the route to Santiago in a way which clearly illustrates the relevance the ancient martyrs have to our troubled world today. If you like mystery, intrigue, history, religion, philosophy, spirituality, travel and romance, tnen you need to read Pilgrimage to Heresy. The narrative centres on a real-life controversy about whose saintly bones actually lie buried in the Santiago de Compostela in northern Spain, a cathedral dedicated to St. James the Apostle. The action takes place along the Camino, an ancient pilgrimage route, and the drama unfolds amidst a colorful backdrop of the stories of various pilgrims from around the world, the challenging terrain,the spiritual journey of the main protagonist, Miranda, and a mysterious manuscript about Priscillian of Avila, an early Christian condemned to death on charges of heresy by the Catholic Church. Although a fictional account, the book raises many serious questions about church dogma, early Christian history and gnosticism and is based on extensive research. Well worth the read. "(Pilgrimage to Heresy) succeeds in raising serious concerns about the authenticity of the remains revered as those of Saint James while reminding us that the identity of the relics is secondary to the undeniably good influence of the act of pilgrimage itself. The book is written with passion, but without brow-beating the reader; she points out inconsistencies in the evidence for Saint James being buried at Compostela, while suggesting sound political reasons why the pretence has been allowed to persist so long. The central character, Miranda, is a likeable heroine, and her fellow pilgrims are equally agreeable. There is no adversary – the challenge is the Camino itself, with all the doubts and despairs which are the real stumbling blocks for the pilgrims." 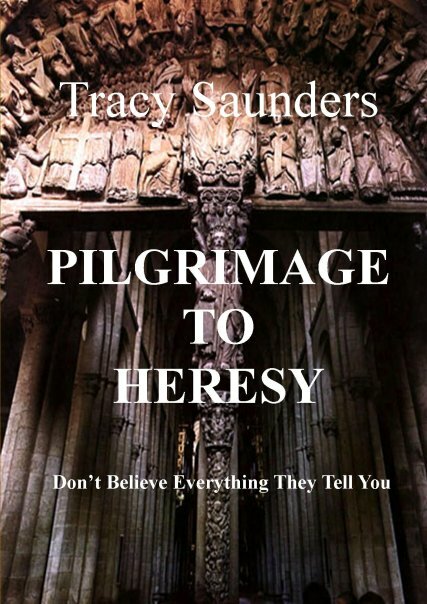 "If you are fascinated by Compostela and you are seeking a novel approach to the mystery then Tracy Saunders´ Pilgrimage to Heresy is the book for you." I have just returned from a driving trip to Santiago . This time I drove 1180 kms in 14 hours. The last time it was 860 kms in six weeks. Was there any difference? Yes, of course. This time I had only myself to talk to. I played all my favourite tapes (Pat Metheny, Annie Lennox, Paul Simon, Hugh Marsh – who is Canadian, Alannis, tambien, a bit of Spanish stuff). I had no-one to talk to but myself, and I did a fair bit of that – and answered myself at that. Santiago called me, and that was that. It was all meant to be so simple. I booked an airline ticket in February. Me voy a Santiago, I announced. I wanted to do some promotion for my book but above all, I wanted atmosphere, “Headspace”: a time to remember who I was, and why I had walked for so long. However, as I have read recently on another Pilgrim Forum, "God laughs when he hears you are making plans". The night before my flight, I couldn’t find my passport, nor could I find my Spanish “Residencia”, which was with the passport. I took a “monton” of stuff (including a fotocopia of the misplaced passport) with me to the airport with my photo (“Look…it’s me! ), but to no avail. After a few tears, and I am sorry to say a temper tantrum, I realised that I was not supposed to get on the plane. So I drove, with a short stop for a kip in a truck stop parking lot – in my sacred sleeping bag; I even had my Shell over the mirror- in Zamora. I saw the sun come up over Cebreiro and realised that all was well. In fact, all was better than I had expected. I was free of deadlines, and schedules: a Pilgrim once more. Of a different colour. Pilgrimas come in different shapes and sizes. It only took a morning, a short morning, for me to find out.. The pilgrim mass was not well-attended, but the nun who sang had a beautiful voice and I settled myself down in front of the supulchre (actually: parked my bum where the Pope had parked his is more accurate and a lot more poetic) to listen. Almost no-one came through, and I sang my responses, very quietly and with no little embarrassment, even though there was no-one to hear me. Afterwards, I went up to give the apostle a hug. Perhaps I was too long. I was poked in the back by the priest wielding the collection box to move along. I was “not amused”. Oh well. They have to have something to do after all. I wanted to go to Padron. I have written about Iria Flavia in my book but have never actually been there. Don’t blink…you’ll miss it. The church, in Padron, dedicated to Santiago was closed, and in the bar adjacent I was greeted with a blank stare when I asked for the key.. Again…oh well. Asi es la vida de los pelegrinos. I met a pilgrim from Austria near the bridge: "Can I help you?" I asked. "Estoy completamente perdido!" she answered, so I gave her directions to the Albergue, but she refused my offer of a lift. We forget. I drove down the river to a lovely spot called Dos Torres, and had a small picnic (and uprooted some violets which are now sort-of flourishing on my terrace in Marbella). The next day I went to Lugo – another place I had written about, but had never seen. To my astonishment, not only was it exactly what I had expected and written about (right down to the apple trees, for heaven’s sake), but I felt totally familiar with the layout. Maybe it was just because the old city is so well contained within its walls. Maybe I have been there before. Who knows? That night I sought out Casa Manolo and found that it had changed location, and become very contemporary in décor but still served brilliant menus for 8 Euros, (try the chiperones - scrumptious) including fresh strawberries for dessert. A pilgrim landmark despite the changes. The cathedral itself presented more changes than just the sentinel with the collection box (which I didn’t contribute to: I saved my money for Santa Susanna…women especially: do seek her out for her look of courage and resignation. She’s “around the back”). No longer can you imprint your fingers in the Tree of Jesse, neither can you knock yourself out on the Santo dos Croques: they are being preserved “for Restoration”. God knows what that means, or what the Pilgrims of Ages Past would have made of it. Maybe they are going to fill in the fingers with cement to make them nice and smooth again? I was directed to the Sacristan for complaint, but honestly, what is the point? Anyway, I saw several people strain themselves over the railings. And quite right. Finally, after four previous visits, I saw and smelled the Botefumeiro, which is, no pun intended, the Essence of the Cathedral, and sat in the right hand corner in front of the Portico de Gloria and just…well…Glorified. Yes, you can go back again. What you take with you may be different, but you know, what you come away with will be the same. If you just listen. Interview with Mark Shea about his new film, The Way – Spiritual Journey along the Camino de Santiago. Published on October 9, 2008 in -Way of St James and Spain.